We have an excellent selection of hedging plants with edible fruits as well as an edible species based Native Hedgerow mix. These species are great for foraging to collect nuts and fruits for jams, jellies and more. Pass me the Sloe Gin! Many of our hedging species produce edible fruits, nuts or berries, make your own foraging hedge by choosing from the plants on this page. If you arent sure which plants to choose we also supply a specially selected Edible Hedgerow Mix - and even A Gin Makers Hedgerow! Hedges with edible fruits – Hedgerows can serve many purposes such as marking boundaries, providing security or privacy, enclosing livestock and they look great – but by choosing species with edible fruits, nuts or berries it is also possible to have a ‘hedgerow harvest’ or ‘foragers hedgerow. Many of the species included in our ever-popular Mixed Native Hedging will produce edible fruits, we have even developed our own Edible Hedgerow Mix which may be of interest – and inspired from this we have our fun themed Gin Makers Hedgerow which will produce crop of berries and fruits suitable for wine making or infusing with Gin or other spirits to flavour them. There are many types of hedges with edible fruits to choose from and a single variety of plants may be used to make a hedgerow or a mixture of plants to provide smaller quantities but a larger variety for the kitchen. The berries of Quickthorn or Hawthorn which forms a basis of many native hedgerows producing large volumes of fruit, can be used in making conserves and sometimes wine or syrup. Like many smaller and harder fruits or berries they are best if roughly chopped up in a food processor and boiled with some sugar and water to make syrups or jellies – there are many such recipes online. 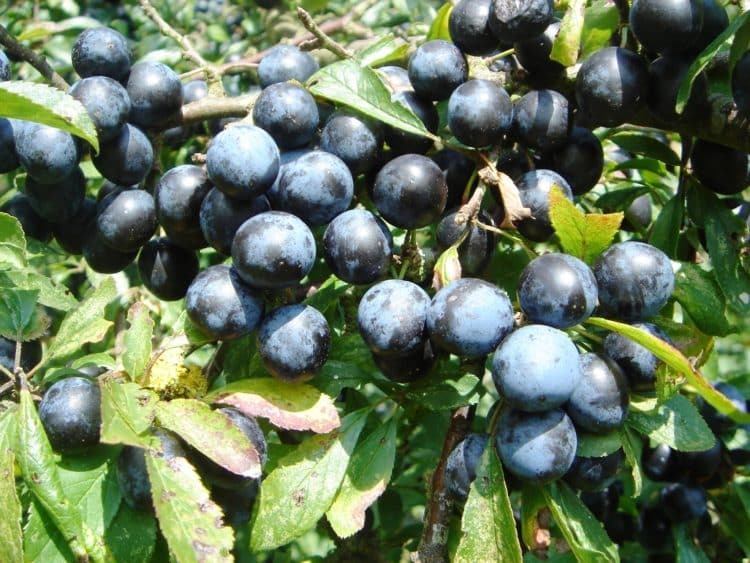 The sloe berries of the Blackthorn (Prunus spinosa) are famously used in the production of sloe gin with the spent berries being combined with apples to make jam. Elder (Sambucus nigra), another prolific growing plant for hedging produces clusters of flowers in spring which if picked and tied in muslin can be used to infuse with gooseberries or to make elderflower champagne and cordial. Once transformed into succulent purple/black berries high in vitamin C they can be used in wine making, jams and chutneys and combined with other fruits in pies and crumbles. All the rose species used in hedgerows will provide luscious hips of varying size and colour depending upon the species, these are again a good source of vitamin C and used for making jellies, syrups, sauces and tea amongst other things. Sea Buckthorn, a name that does not necessarily spring to mind instantly, is one of the current superfoods with its berries full of nutrients i.e. 14 essential vitamins, Omega’s 3,6,7 and 9 to name but a few. The juice from the berries can be used several ways for instance as a substitute for lemon when serving fish, as an addition to sparkling cider or champagne to make Sea Buckthorn Fizz and to infuse in apple vinegar to name but a few. Other hedges with edible fruits are the Wild Crabapple popular for making jelly, Myrobalan or Cherry Plum eaten fresh or made into delicious jam, Wild Pear and Amelanchier or June Berry which has similar properties to the Blueberry and more, is high in fibre and can be eaten fresh or made into beer, wine, cider or tea, jams and spreads and eaten in pies. These are just a selection of edible wild fruits available to be found in the hedgerow. Its worth bearing in mind that fruiting hedgerows will almost always produce their crops from flowers appearing on the previous years wood and so a very tightly clipped hedge will not be very productive. To get the best from edible hedging we recommend trimming just one side each year if possible, the side that has not been trimmed being the productive side the following season. (Trimming the top in alternate years). Such a hedge will also provide a lot of cover for wildlife, especially nesting birds. Some of the species below could also be left to develop into small fruiting trees along the line of the fruiting hedgerow, particularly Wild Crab Apple, Wild Pear, Amelanchier and Myrobalan Plums.